This fall I read my second murder mystery set on Grand Manan. As a disclaimer, I should mention murder is pretty rare on the island as is most violent crime. I sometimes forget to lock my doors and I leave the keys in my car while at work. I still have my car but sometimes the wind will blow my door open. That being said, I really enjoyed the story in this book. It was written by an ex-RCMP officer who, while never stationed on Grand Manan, did work a few shifts on the island. There were some inconsistencies between real life and the book (some of which he acknowledges) but I didn’t find them jarring or disruptive to the narrative. The fact it was set in the 1960s also helped in that regard. In fact, it was easy to picture some of the places and events in the book: the unrelenting fog for days springs to mind. The mystery portion was intriguing enough to keep my interest without being so tense I couldn’t sleep at night (an important component of my nighttime reading). I’d definitely recommend this book as a mystery and for its Grand Manan connection. Fall also means a rash of birthdays with a double whammy in the middle of the month. Since their birth, my nieces have worn pink and purple which was sometimes the only way I could identify who was who. So, their birthday mittens reflected those colours. (My own pattern in Knit Picks Swish Worsted Brights Vibrant Violet and Pucker). 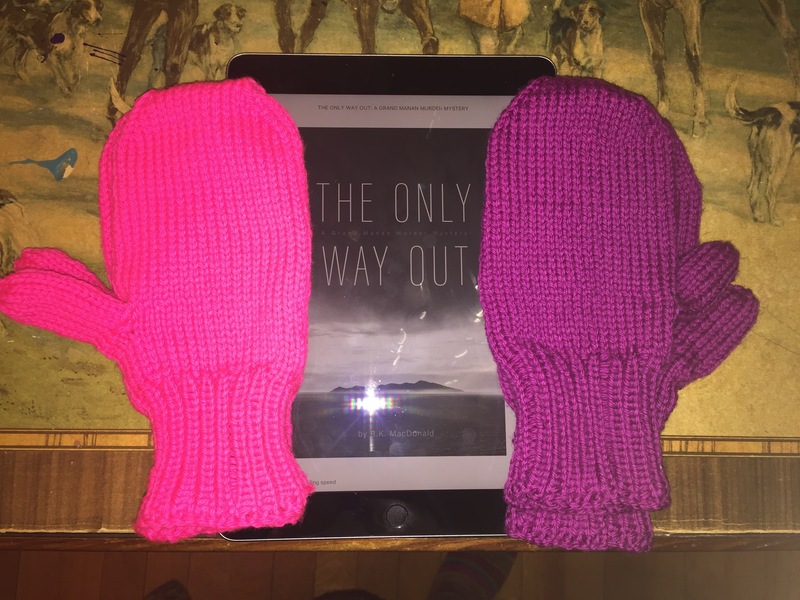 Linking up with other Yarn Along readers and knitters. A couple of weeks my Facebook feed was abuzz about a mystery novel that was set on Grand Manan. While it wouldn’t necessarily be a book I would choose to read, the idea of a book set on the island was too good to pass up. Had the book not been set on the island, I likely wouldn’t have stuck it out to the finish, but by the end I was anxious to see “who done it”. I guess in the end it “got me”. Meanwhile, I’m in the midst of seven days of travel for work. There hasn’t been a lot of knitting time until today’s meeting, but I’m working on finishing some travel knitting that I’ve been carrying for a while, namely a sock and a dishcloth. Linking up with other Yarn Along posts. I’ve been on a bit of a non-fiction run with my reading lately. 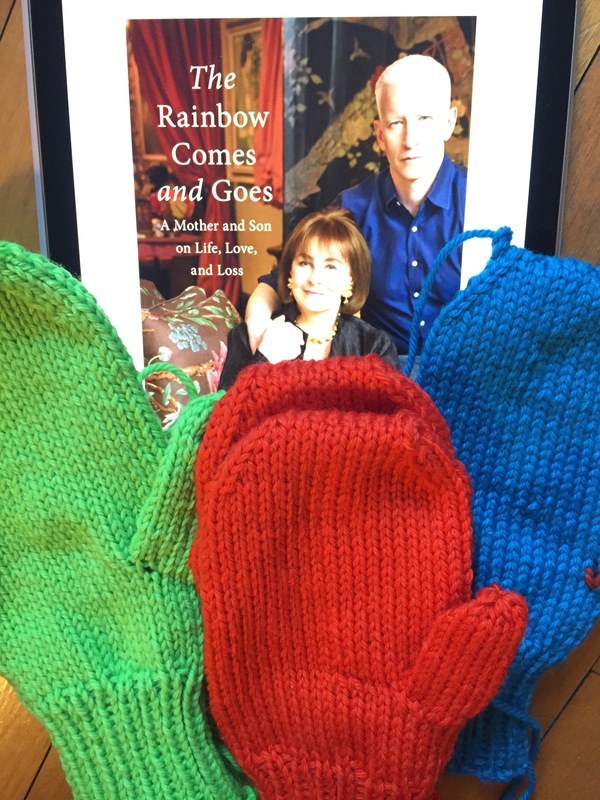 One of the hi-lights has been this autobiography, “The Rainbow Comes and Goes”, by Gloria Vanderbilt and Anderson Cooper. I remember watching Anderson Cooper on “The Mole” (I was a bit of a reality show junkie for a while) and was amazed as he transformed into a serious journalist on CNN. Growing up in the 80’s I knew Gloria Vanderbilt because of her jeans. Bits and pieces of her story crept into my consciousness but I didn’t really understand how varied her life was until I read the book. The book itself is easy to read; it’s billed as a series of emails between the two over the course of a year. While there may have been some prompts to move the story along, it is like listening to a conversation between a mother and son who have lived remarkable (and tragic) lives in the public eye. Their perseverance though different ways of dealing with that tragedy is as fascinating as it is inspirational. CNN also aired a documentary “Nothing Left Unsaid” a few weeks ago that mirrored the book. I waited until I finished reading to watch it. As always, I’m glad I read the book first but it was interesting to add the visuals. 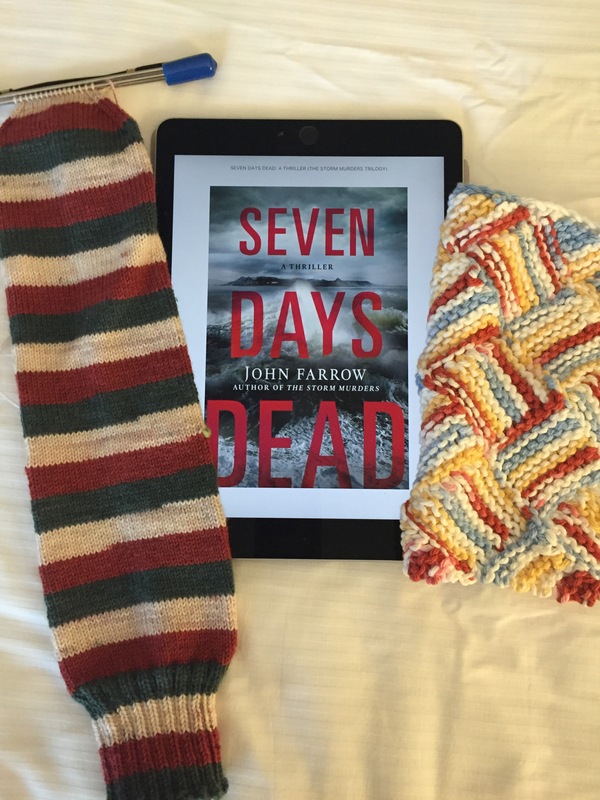 Linking up with other Yarn Along posts about reading and knitting. This photo has basically summed up my free time the past week or so: knitting, a book, and a (thankfully) sleeping dog. Just before vacation I started a baby blanket in the last of my Patons Melody yarn for my newest niece. It’s coming along well, but it’s a blanket, so progress sometimes feels a bit slow. 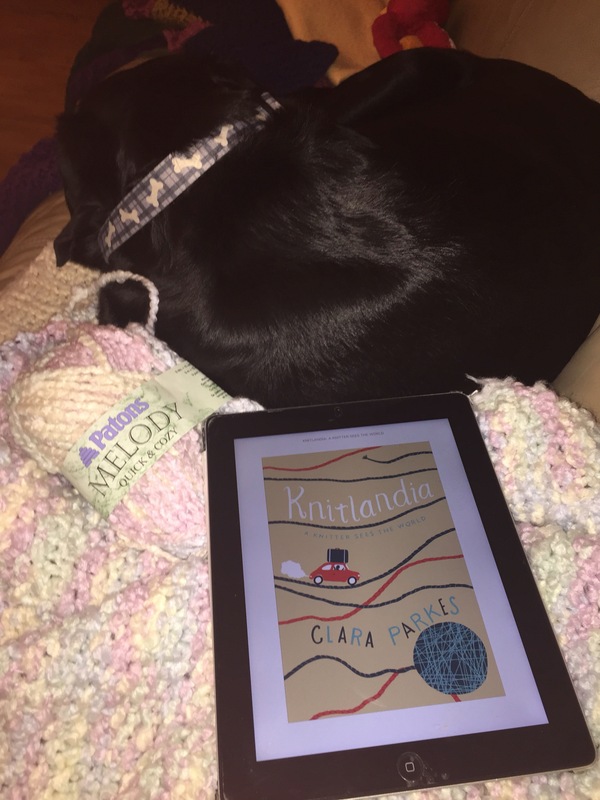 I’ve been engrossed in “Knitlandia” by Clara Parkes. The essays on various knitting trips and adventures transport you to the place and time. 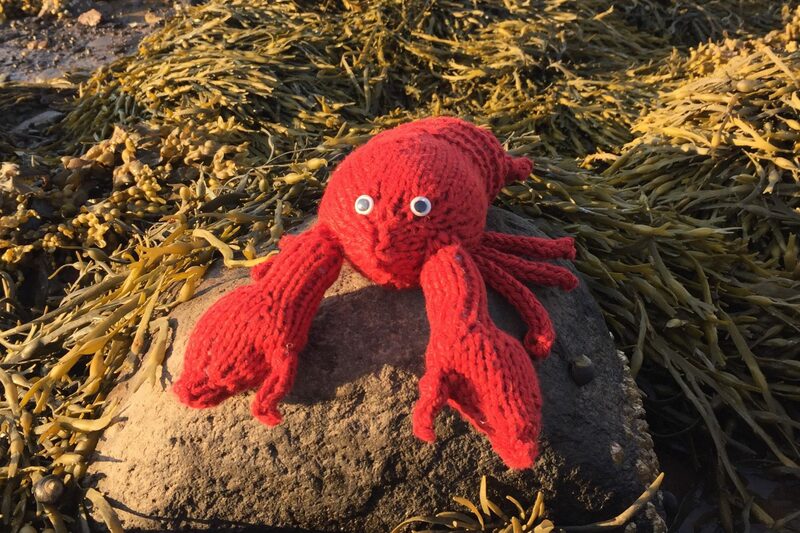 Her description of a knitter’s trip to Iceland sounds at times a bit like an outward bound adventure and makes me want to go and avoid it at the same time. I chuckled again at the story of how 30,000 knitters (completely confounding tech support) shut down the servers attempting to register for the now defunct Sock Summit. While I’ll never have the opportunity to experience many of these trips, I feel a bit more connected to the different feel and spirit of each event. I highly recommend the book to any knitter who has, or has dreamed, of knitting travel. Check out other Yarn Along posts for other knitting and reading related posts.